Image Size: 22.25 X 28.125 in. My thoughts fly up like birds it the sky. I am free. I can fly. I go everywhere. I see everything. Towering mountain ranges and a tiny flower growing in the desert. I see cities and highways and a fallen tree I see a grandmother telling a story to a child. 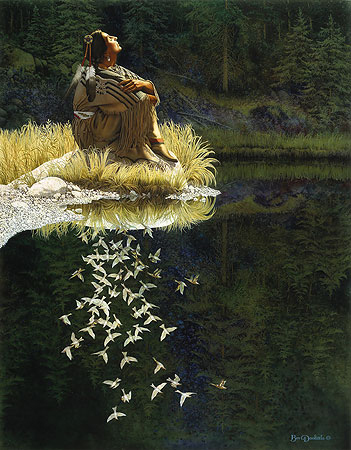 I sit quietly but my thoughts fly up like the birds in the sky. Only I know where they go. When you sit quietly,where do your thoughts go?